The quilts were stunning and the stalls tempting. 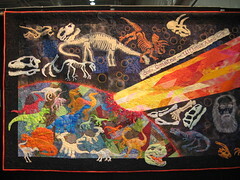 This was one of the really impressive quilts from the show. I have uploaded some of my favourite quilts on Flickr to enjoy. For once my camera did not fail me! 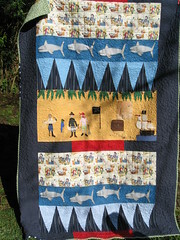 Here are the photos of the pirate quilt. The design is called, “Party on Shark Island” and I purchased it as a kit from the lovely, talented ladies from Material Obsession. Those ladies are sorceresses with fabric. Emi’s Patch in Eastwood quilted it for me. I love it and so happy with the results. More importantly, the little guy loves it and has it on his bed. I had a hard time trying to capture all the detail on the camera, so more photos on flickr. 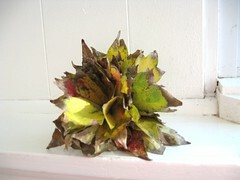 I left the show full of craft projects and enthusiasm! Saturday night I was planning to upload photos, update the blog, and work on the next baby quilt for my cousin. My husband was at the pub watching the rugby so it was going to be me, a glass of wine and craft. There was a soft knock at the door about 6:30PM and I was greeted with the news that our cat Tiger had been attacked by a dog on the street and was in a bad way. I had to call my husband home, organize a neighbour to watch the kids until he came and then ran the cat to the emergency vet. I didn’t even recognize my poor cat that was torn, covered in blood and lifeless. I think he was dead when I picked him up, but I still wanted him looked at by a vet in case there was anything that could be done. We are so very sad. The tears just keep coming and coming. 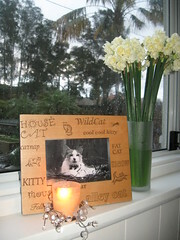 This little guy was part of our family for eight years. I am sick at the thought of how he went and the pain he must have experienced on that cold, winter night. Peace Tiger. We miss you and life is not going to be the same without you. 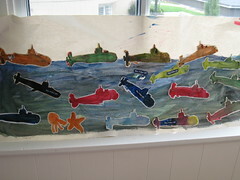 Here is the final project from the submarine stencil. I am still trying to cut out the new stencil using the oiled paper technique to try with t-shirts. I have a major announcement…….I finished the pirate quilt. It feels so good to finally have it completed and resting on Rhys’ bed. He loves it which is reward enough since he went through a very anti-pirate stage. I took some photos today, but they are just way too dark. I am going to attempt again tomorrow. Speaking of average photos, this one isn’t the best either. I am just going to go ahead and blame the weather and not the photographer. Speaking of tomorrow…………I feel like a kid on Xmas eve. 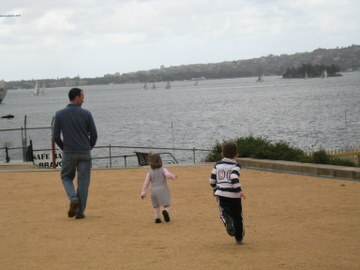 I am going to the Darling Harbour quilt show sans kids! I am so excited! I missed it last year and feel quite virtuous in finishing my pirate quilt that I feel justification to run out and buy a whole bunch of new projects Ha ha. Sloan has not slept the night since last Friday and I am tired, tired, tired. I hope we get some sleep tonight so I don’t make bad, sleep deprived decisions in fabric buying tomorrow. No sleep and major fabric selection do not mix. What a wet three day weekend in Sydney! We were in self imposed quarantine for the weekend with a very sick Sloan. She was cranky Friday and just went downhill from there. We finally figured out why she was so cranky: foot and mouth virus. Poor little lady has been in so much pain and discomfort from a sore mouth and sores on her feet. She can’t eat and drinking is painful too. It is such a gross childhood virus I cannot even tell you and the sleepless nights we have had with her screaming in pain. I just keep trying to get through each day because the only thing that helps is time to heal. 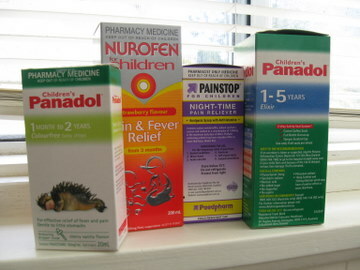 Here is a photo of the pharmacy cornucopia we are trying in managing her pain which is heartbreaking to experience. The only thing that will help is time because it is a virus. I just keep trying to get through each day. 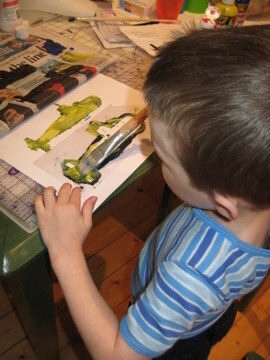 We had ample time to crunch out some kid craft in the wet weather. 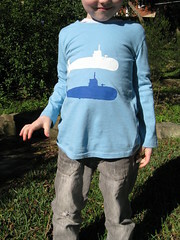 I read a lot of blogs about stencilling and thought that could be the right approach for the submarine t-shirts. I first tried the freezer paper stencil that a lot of crafters use for t-shirts and I could not get the darn stencil to cut through the layers of freezer paper. I then moved to a light weight plastic that I use for quilt templates and that works okay. It isn’t brilliant, but it is doing the trick. 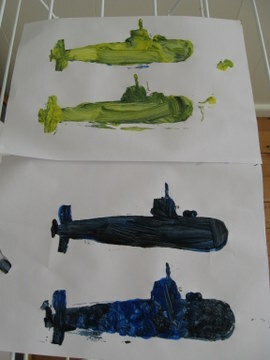 Here are some more submarines we made today with paint and paper. Rhys loved this craft! I need to buy some fabric paint and try these out on some fabric. The result is okay, but not crisp. Loobylu had this really helpful post on stencils in April click here. I am going to try the oiled craft paper next to see if that is better. Wish me luck. Please let me know if any of you have had better luck with other techniques. I would love some help or suggestions if you have any in the stencilling world. Last photo is of the brief glimpse of freedom we had yesterday when we exited the house for morning tea between rain showers. We had so much fun collecting flowers for the flower press and getting out of the house for a brief moment. Hopefully this week will be onward and upward. The anticipation for the Quilt and Craft show is keeping me going.